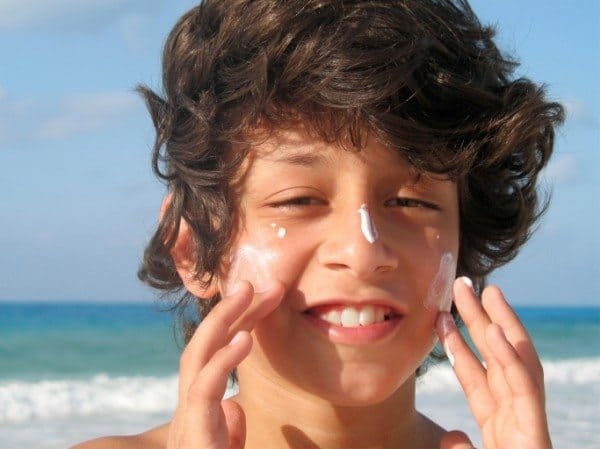 UVB, UVA, UV: RU Confused By Sunscreen? Sunscreen. Did you shudder when you read that word? If you’re anything like me you probably did because the simple thing we use to protect our kids and ourselves from sun damage has suddenly become very complicated. Doesn’t it seem like we’re hit with a new guideline or warning on a daily basis? Use spray, don’t use spray, use zinc, don’t use zinc, don’t use this one because it has X in it, use this one but not too much, apply every two hours, don’t apply too often, UVA, UVB—UVWTF? Honestly, sometimes I think the best thing to do is just keep everyone indoors until October. But since I’m not crazy enough to do that, I decided to instead try to make a little more sense out of the great sunscreen debate. And hopefully what I discovered will help you in your efforts to protect your family from the unforgiving sun this summer, too. Per my sons, it’s “the horrible stuff mommy rubs on our bodies after she chases us through the house and tackles us to the ground,” but as you surely know, sunscreen is a product that helps prevent the sun’s UV rays from reaching the skin. There are two types of UV rays: UVA, comprised of both the UVA1 and UVA2 rays, is the longer wave and therefore more dangerous because it causes skin damage, aging and cancer. It’s important to note that, although some sunscreens say they protect from UVA rays, they may only protect from one of them and not the other. (The way you know your sunscreen is protecting you from both is to look at the sunscreen’s active ingredients’ list. Here’s a great list by Skincare.org). UVB is the shorter of the UV waves and it’s the one that will give you sunburn. However, it can cause skin damage and cancer, too. Most of the sunscreens we used in the past only prevented UVB rays, and since we didn’t get sunburned when using it, we thought that they worked pretty well. However, we now know that additional protection from UVA rays is critical to preventing wrinkles and, far more seriously, cancer. My take? You need sunscreen that contains active ingredients that protect you and your children from UVA (both UVA1 & UVA2) and UVB rays. For example, zinc oxide, which blocks all of them. Broad spectrum sunscreens block both UVA and UVB rays and, at SPF 15 or above, are the best way to prevent skin damage and cancer. The FDA allows sunscreens to put “Broad Spectrum” on their labels if they pass the FDA’s test for protection. (Note: We weren’t able to determine if the FDA’s definition of broad spectrum includes both UVA1 and UVA2 rays. We looked really hard. Nice reader, if you can confirm, we would love for you to share the link in the comments section.) Any sunscreen not labeled “broad spectrum” or with an SPF between 2 and 14 has only been show to prevent sunburn and is required by the FDA to put a skin cancer warning on the bottle. Be sure to look for the words “Broad Spectrum” on the front of the bottle or tube you’re using. Not all sunscreens are made with the same ingredients. Some use zinc oxide and titanium dioxide as physical sunblocks, while others use chemicals like avobenzone. There are also newer active ingredients like Helioplex and Meroxyl SX, which scientists currently favor because they don’t break down as easily as others. Currently, there’s a hot debate going about the sunscreen ingredient oxybenzone. The Environmental Working Group (EWG) is concerned due to findings that this organic compound has been shown to penetrate into the skin, however it’s still approved by the FDA as well as by Dr. Warwick Morison, MD (chairman of the Skin Cancer Foundation’s Photobiology Committee and Professor of Dermatology at Johns Hopkins University) who accuses the EWG of using “junk science” in their evaluation. There is also an ongoing debate about the safety of zinc oxide nanoparticles, an ingredient found in many popular brands and currently approved by the FDA. While it’s still used by many popular brands, the Badger brand, for one, has stopped using it and now uses ‘larger’ nanoparticles of zinc and Thinkbaby/ThinkSport uses what it lists as “non-nano” zinc oxide in its active ingredients list. It should be noted that the EWG recommends using sunscreens that contain minerals like zinc and titanium. They also say that if you don’t want the nano-scale minerals those may contain, your choices are then non-mineral products that contain at least one sunscreen chemical considered to be a potential hormone disruptor. I know, a little damned if you do, damned if you don’t. My take? Where there’s smoke, there’s usually fire. Meaning, I don’t know for sure if oxybenzone or zinc oxide nanoparticles are harmful, but if there are less controversial options out there that are still effective, that’s what I’d prefer to use. Remember when all of the news stories came out saying that you shouldn’t use sunscreen spray on kids because they’d get it in their lungs? I wasn’t able to find much to back that up in my research, however the FDA’s current stance of sunscreen spray products is that they have “requested additional data to establish effectiveness and to determine whether they present a safety concern if inhaled unintentionally. These requests arose because sprays are applied differently from other sunscreen dosage forms, such as lotions and sticks.” So I guess we’ll wait and see what they find out before making the call. But personally, I don’t like sunscreen spray. The mist seems to linger in the air for a very long time after you’ve used it and I’ve repeatedly gotten it in my mouth when I’m downwind of someone spraying sunscreen at the pool. (Blech.) I say take the extra five minutes to rub lotion on your child and you’ll have one less thing to fret about. It should be applied one-half hour (30 minutes) before going outside, giving the skin time to absorb it. Because sunscreen tends to be broken down over time by the sun, and rubbed or washed off with sweating and water exposure, it should be reapplied at least every two hours outdoors, and immediately after swimming or heavy sweating. At least one ounce (two tablespoons) is needed to cover the entire body surface. Experts say to apply it 25-30 minutes before going out into the sun. Moms know that this isn’t always possible, but still try to do it as early as you can so it has a chance to settle on the skin. Sunscreen should be reapplied every two hours, no matter what SPF you use. If you have trouble remembering this, maybe set a timer on your phone as a reminder. The right amount of sunscreen to use on a child is the amount that fits into a shot glass. And if you’re a parent, you probably have a shot glass close by. Also, per the FDA, sunscreen makers cannot claim their products are “waterproof” or “sweatproof” or identity their products as “sunblocks.” And they cannot claim “instant protection” unless they submit data and get approval from the FDA. So don’t fall for it. No matter which sunscreen you use, please remember that it’s still a good idea to wear a hat, clothing and avoid the sunniest times of the day as much as possible. I know that’s not realistic for most of us with active kids, but it’s really considered the best way to protect yourself and your family from sun dangers. I hope this information helps you all understand sunscreen a little bit more. I know it helped me. And please be sure to check back later this week when I’ll be posting my review of the many, many sunscreens my kids and I tested out this summer. (To their HUGE delight.) (Yes, I’m being sarcastic.) We found a few that we love, a few that are just okay and a few that made us want to move to an underground bunker instead of ever using them again. Update: here’s the link to my reviews of the sunscreens we’ve tested out over the years. Now if you’ll excuse me, I need to go rinse the sunscreen out of my shot glass because I’m going to use it for something else. Something else that won’t prevent wrinkles, but might make me forget about them for at least a few, happy minutes. No SPF required.